DSL is fairly simple to set up on your computer. Here are the basic instructions on how to connect your computer to the Internet with a DSL modem. Please note that the modem you receive from JCS High Speed DSL is pre-configured and ready to go - you don't need to do any setup. If you get a modem from JCS DSL, it will be pre-configured and ready to go. 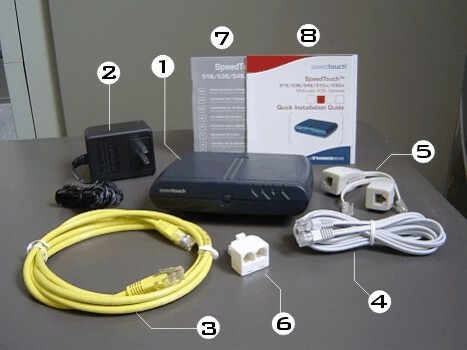 If you already have your own DSL modem, please follow the instructions that came with it. Install filters on all phones that will be on the same phone line as the DSL modem. If you want your computer and your phone to share the same phone line jack, you need to use the line splitter. Plug the splitter into the wall jack, then plug a line filter into one outlet of the splitter, and the modem cable into the other one. Then plug your regular phone into the line filter. You must ensure that all analog telephone devices (telephones, faxes, answering machines, home security systems, etc) are filtered with a phone line filter. Do not install a phone filter on the DSL modem -- that prevents the modem from working. If you need more filters, contact JCS DSL. Plug the power supply for the modem into a standard wall outlet. It's strongly advised that you protect your modem from power spikes and brownouts by using a backup power supply or surge-protected power bar (available from your local computer store). Plug the power cord into the back of the modem. Plug the other end of the Ethernet cable into the Ethernet jack on your computer (it is the one that looks like a phone jack but is wider). If your computer doesn't have an Ethernet port, JCS DSL or any computer store can install one. If you want more than one computer to use your DSL connection, or if your computer is part of a LAN, contact us if you have any problems with the setup. Plug one end of the modem cable (the grey cable) into the grey jack on the modem (it is labeled DSL). Plug the other end of the modem cable into your phone jack. If you have a power bar or backup power supply that also has a phone line protection jack, your modem will not work if you plug it into that phone line jack -- you must use a regular phone jack. Turn on the modem by pressing in the switch on the back. Within a minute or two, at least two lights on the modem (power and DSL) should come on. The Internet light may or may not light up before you start your computer. Turn on your computer. Once your computer is ready, you can start surfing.